Don't know how to open Champagne bottles? Don't fret! While opening a bottle of sparkling wine may not be intuitive, it is quite easy and we will give you a few tips on how to do it best. You want to open a Champagne bottle in a way that both respects the precious beverage inside the bottle but is also elegant and fun. Opening a bottle of Champagne has a feeling of excitement and celebration about it. It is classically associated with parties, celebrations and New Year's festivities. However, Champagne and other sparkling wines have many more purposes than just celebration. Many sparkling wines are much more versatile at table than most people realize. Champagne is a brilliant match with a number of cuisines. It shines with spicy foods like Indian and Thai cuisine. It's bright intensity is a great foil for sushi and it pairs beautifully with rich, creamy cheese. Therefore, Champange or other fine sparkling wines are a great choice for a wine theme dinner party or wine tasting. 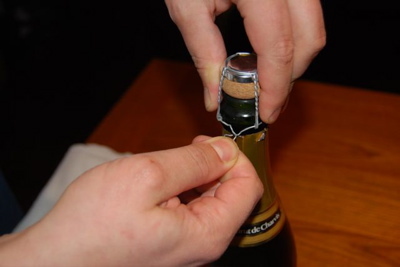 But before you go and plan your next Champagne tasting, be sure you know how to open Champagne bottles comfortably first! Most people have seen Champagne bottles shaken up and popped violently, shooting the cork across the room followed by a fountain of foam shooting across the room. While this has helped build the reputation of sparkling wines as the perfect celebratory beverage, this is not the ideal way to open a champagne bottle. For one, shaking up the wine causes excessive bubbles and the wine you are left with is under-carbonated. Also, you loose a large part of the bottle in that foam that shoots out. When learning how to open Champagne you should realize that in fact the correct way to open a Champagne is by gently sliding out the cork so that only a small hiss of air comes out. Granted, this is not as exciting and celebratory. However, it maintains the appropriate carbonation in the wine and prevents losses of your precious liquid! Some people will pull out the cork just fast enough to make a bit of a pop noise but without causing excessive foaming and loss of wine. The choice is yours, but if serving wine in an elegant way which is respectful to the beautiful wine in the bottle is your goal, then go slow! When serving Champagne or other sparkling wines, they often show best when well chilled. They tend to get flabby and coarsely carbonated when they warm up. Chilling will also help prevent excessive foaming when you learn how to open Champagne bottles. A Champagne bucket is simply a large (usually metal or glass) bucket into which you put ice water and your bottle of wine. It sits on the table, or some have their own stand, and keeps your wine well chilled while you drink and discuss the wine or enjoy your dinner. 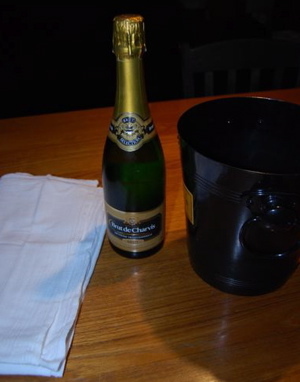 After you learn how to open Champagne, we strongly recommend using a Champagne bucket when serving sparkling wines. After you open Champagne the carbonation starts to dissipate. If you are quickly pouring most of the bottle at a large party, wine tasting or dinner party, or if you plan to consume the bottle quickly, this is not a problem. However, if you have wine left in the bottle which will likely sit for a while, then a Champagne bottle stopper is a good wine accessory to have handy to prevent the wine from going flat. 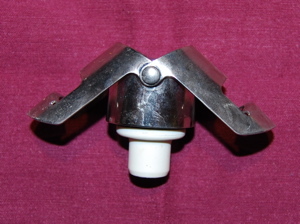 There are different versions which can be bought at wine shops but basically they are a crown that goes on the bottle and has some mechanism for securing it to the top of the bottle. 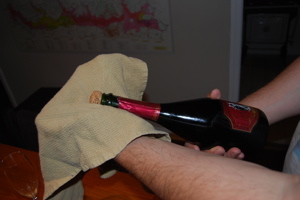 You can't use a standard wine cork or bottle closure because the carbonation will push it up and will leak. These special stoppers hold pressure so that your carbonation dissipates much slower so that you can keep your Champagne to enjoy over a prolonged period. Keep the bottle chilled in your Champagne bucket while stoppered! We finally get to it! Now the fun part. 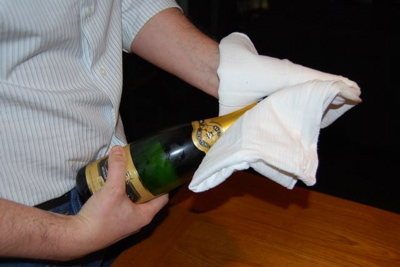 For practice to learn how to open Champagne, if you have never opened a Champagne bottle before, I recommend trying once or twice at home before hosting a wine tasting or dinner party. While real Champagne can be quite expensive for practice, you can find inexpensive American sparkling wines at most markets with which to practice. One important first step when learning how to open Champagne is to recognize the importance of chilling. Before opening, make sure your bottle of sparkling wine is well chilled. Sparkling beverages bubble and foam much more at warmer temperatures. I suggest sitting your bottle in an ice water bath for at least 15 to 30 minutes before opening. Alternatively, you can set your bottle in your refrigerator for at least 30 minutes. Find a kitchen towel (preferably an attractive one if you are serving guests!) and bring that and your chilled bottle to your table. The first step is to remove the foil capsule on the top of the Champagne bottle. Some bottles have a tab that you can pull to cut the foil around the top for easy removal. If not, you can simply pull the entire capsule off or cut it with a foil cutter like you would for a regular wine bottle. However, note that you should cut further down on the neck of the bottle as the very top of the capsule is over the cork and wire cage. 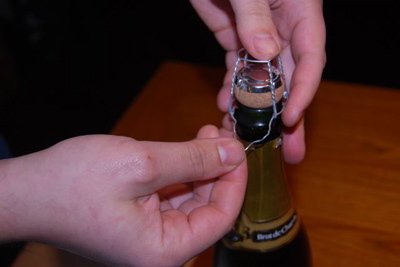 Once your foil is off, you will have exposed a wire cage that covers the cork and holds it down. This cage has a little handle, shaped like a wire loop, which is bent up against the side of the cage. Pull this down so that it is perpendicular to the bottle. 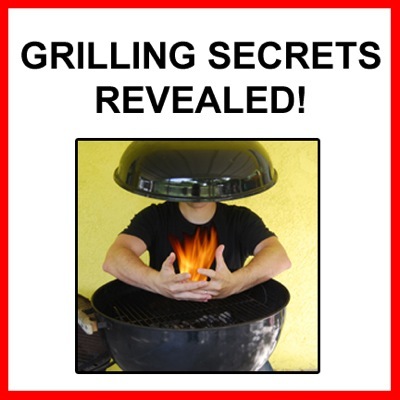 Twist it with your fingers counterclockwise until it releases. When it is loose you can open and remove the cage completely from the top of the bottle. Set this aside. Alternatively, some people choose to simply loosen the wire cage but to leave it on while pulling out the cork. From this point on, be aware that the cork is free and can occasionally be pushed out by the pressure in the bottle. This is particularly true if the bottle is not adequately chilled prior to open. So keep an eye on it or keep your hand on it at all times. A flying cork can actually cause harm so watch out! Now the important part! 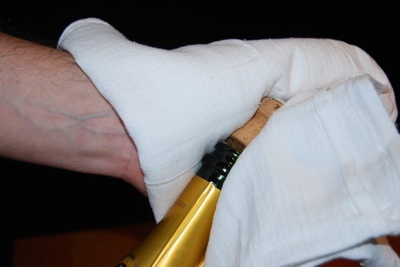 Wrap the towel around the head of the cork and grasp it firmly with your left hand, holding the body of the bottle in your right hand. With your right hand and the base of the bottle steadied against your hip or the side of your body, slowly begin to twist the bottle while holding the cork still and providing some counter-traction with your left hand. As you twist, slowly increase the distance between your hands so that the cork twists out slowly. This should all be done in a slow and controlled manner so that the cork does not pop out too fast. As you get to the end of the cork, slow your pulling and twisting so that the last bit of cork comes out very slowly and in a controlled manner. It actually helps to slightly resist the cork's movement out and try to push it back in. This will help slow its exit so that it comes out gently. In this way you can limit the escape of air to a faint hiss. Be sure at this point that the bottle is angled upward somewhat so that when the cork does come out you are not pouring wine all over the floor or yourself! As it comes free, return the bottle to a fully upright position and return gently to your Champagne bucket or serve immediately. That's it! Not that hard, right? Now you know how to open Champagne. If you've never enjoyed Champagne before and don't know how to open a Champagne bottle it may seem daunting, but just give it a try. Good sparkling wine is a thing of beauty. Besides being fun, romantic and celebratory, it just tastes good and compliments a wide range of cuisines. Enjoy! Done learning How to Open Champagne Bottles? 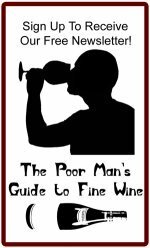 Return to the How to Serve Wine page.